What's in July's Maxie Mail Subscription Sewing Box? Click above to play, or to view it on Youtube click here. Never fear a curved seam! I'll show you every step of the way in my video tutorial for this fun, easy and accurate technique! Are you subscribed? Each month box includes fabrics and supplies for a specific project, and a video tutorial with the goal of building your sewing skills. For more information, click here! Orange Blossom Quilt, made by Maxie; pillows by Sarah Overton. Pattern by Plum Easy Patterns. I've been sitting on this pattern and kit for a while now, and today's the day to share it with you! The fabrics are designed by Bari J for Art Gallery Fabrics, and she had a quilt very similar to this one in her booth at quilt market when these fabrics, Joie de Vivre, were released. She had not created a pattern, however, and gave me her blessings to do so! This is my version, using her Joyeux Alphabet panel (included in kit), and other fabrics from her line, with a couple of Katarina Rocella's tossed in as well! Fabrics are Art Gallery's 100% Pima Cotton, and the kit includes all fabrics for the top and binding. Backing is not included, but note in a photo below that I used Bari J's knit as a backing! This quilt is so soft, and at 45" x 63" it's perfect on my chair. At this time I only have two kits, but if I have enough requests I will restock to make more. If you find it's sold out just message me and I'll start a list to see if I have enough requests! Want a matching bin for your quilt? This month's Maxie Mail Subscription Sewing Box was all about bins! 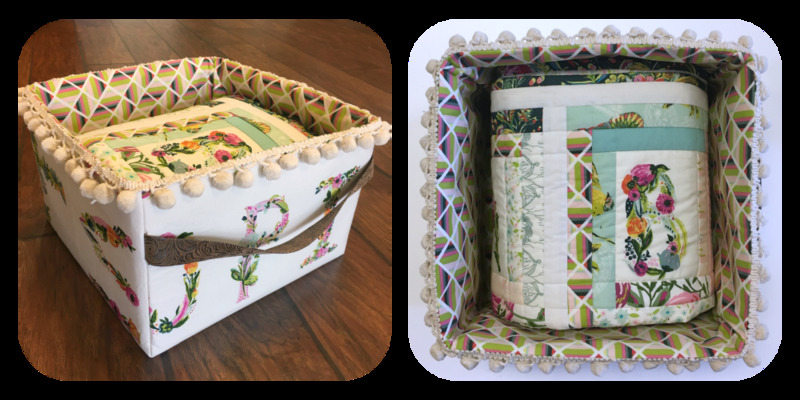 Subscribers received fabrics and supplies to make a set of two matching bins from Dana Willard's pattern, "Hold it Bin", and access to video tutorials by both Maxie and Dana! Have you subscribed yet? For more information, click here! All fabrics are 100% Pima Cotton from Art Gallery Fabrics, designed by Bari J and Katarina Roccella. For a soft and snugly quilt, try using knit as a backing! Art Gallery's excellent knit is about 56" wide, so smaller quilts don't require piecing. At this time I don't offer knit on my shopping page...just check your local quilt shop. Thanks for stopping by! Happy sewing and God bless! Gathered Fabrics have arrived! This is Bonnie Christine's 11th fabric line for Art Gallery Fabrics, and I think I've said eleven times, "This one is my favorite!". Soft green and blush and plum work together to give such a rich, soft feel to this line that is so totally "Bonnie". Scroll below to see a little peek at the free pattern, "Harvest", and I'll post more about that as soon as it is available for download on Art Gallery's website. Meanwhile, we can make Folded Star Hot Pads, which are familiar to Maxie Mail Subscribers because our February box included pre-cut fabrics, Plum Easy Design's pattern, and supplies to make one, with templates to make six more, and a video tutorial! You can make your own in a flash...I made both these in one short evening! Click to enlarge. Harvest Quilt, made from Bonnie Christine's newest line, Gathered, for Art Gallery Fabrics. Quilted by Andrea Walker (center) of Walker Quilt Co.
Cricut + Simplicity Patterns = Clever Companions! I've posted before to acclaim the Cricut Maker's ability to help me sew, and maybe you even downloaded my slipper .svg file and made a pair or two for yourself! Cricut's exclusive new Rotary Blade is what makes this precision cutting possible, cutting fabric with no backing or stabilizer. Did you know that Simplicity Patterns has chummed up with Cricut to make sewing patterns available in .svg format for your Cricut Maker Machine? When I decided to give that duo a try I came across this sweet doggie dress that I knew would be perfect for my Pinkie! Click photo, above, for more information about the Cricut Maker Machine. Making her dress with Art Gallery Fabric's "Wonderful Things", designed by my daughter, Bonnie Christine, would make it even more perfect! Look how accurately the rotary blade cuts! And...the marking pen precisely marked each piece for ribbon, pocket and velcro placement. Click on the photo for a close-up view. One of the best things about Cricut Maker and Cricut's Design Space, is how user friendly they are. They work together so easily and all the guesswork is taken out because you just choose your design, click "Make It", and follow the prompts! It's that easy, and Cricut has an abundant supply of videos and tutorials to help with most any situation that could arise. Bottom Left: Sewing the leash ribbon in place. Bottom Center: Sewing the gathered ruffle in place. Bottom Right: Stitch around treat pocket on fold line. Clip to line in corners. Tip: Glue seam allowance in place and press well. Sew to the front of the dress as shown in the top photo. Top Photo: Finished and ready for velcro. Click to enlarge. No hand fatigue from scissors or rotary cutter. Youngsters can sew small projects without having to use sharp cutting tools. Much easier for handicapped or arthritic hands. Can you tell how much I love my Cricut Maker? Thanks for visiting today! Happy Sewing and God bless! My name is Maxie and this is where I create. I hope you'll grab a cup of tea and make yourself comfy. I look forward to getting to know you and sharing creative adventures with you! 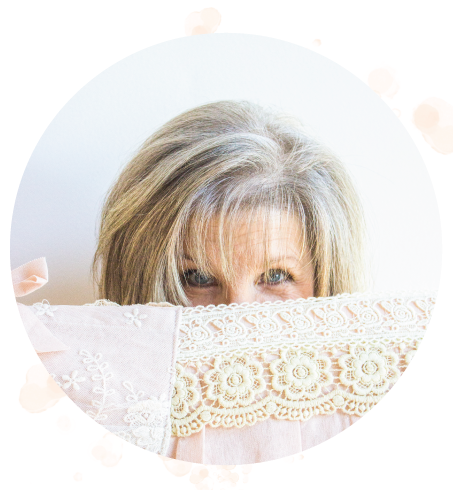 Learn Sewing and Quilting with Me - a Free Video! Give the Gift of Sewing and Save 10%! Gathered Fabrics Tote Bag - The Perfect Whatever Bag! Gathered Fabrics & Free Quilt Pattern by Bonnie Christine! A Tomato Pincushion and Needle Keeper Pattern - A Free Offer when you join my email list! Cricut Maker - The Ultimate Smart Cutting Machine! Binding the Quilt: A Video Tutorial! Machine Embroidering on Hard to Hoop Items!